DACC welding students work on their Christmas display for Butch Bando’s Fantasy of Lights last week at the DACC’s North Campus. The guidelines for the display were that it had to be Christmas and welding related and would include the DACC logo as well as the students’ graduation year. DACC Welding Instructor Brad DeMent said his senior and junior students worked on the project for two weeks and said it was great lesson for students because they had to start the project from scratch. Delaware Area Career Center welding students recently got hands on to help a local business design a Christmas decoration. 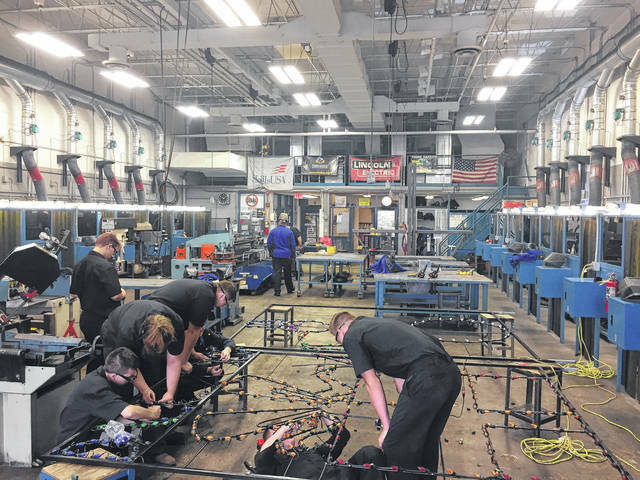 DACC officials said Welding Instructor Brad DeMent was contacted by Dante Bando, the President of Butch Bando Concrete Inc., who asked if the DACC’s welding class could create a display for the upcoming Butch Bando’s Fantasy of Lights. DeMent said the idea is that students would create a new display for the attraction every year. He said the project spanned two weeks and was a great experience for his welding students. The guidelines for the display called for the project to be Christmas and welding related and that it would include the DACC logo as well as the students’ graduation year. The students and Bando settled on having Frosty the Snowman welding a gift with animated lights as sparks. The display reportedly has more than 400 bulbs. Bando said he chose the DACC for several reasons, including because his wife is a staff member and because he wanted to use his business to give back to the community but also because he wants to give students opportunities he didn’t have. DeMent said the project was a unique opportunity for both his senior and junior students, since both classes worked on the project. DeMent said he and the students enjoyed the project and said he was excited to have an annual project like that. “It was a fun project and something that we can look forward to year after year,” DeMent said. “This experience really taught the students that sometimes you just have to take a leap and jump into a project headfirst! We had a person who wanted something created. Sometime, there isn’t a set way to do it, but guess what, you have to figure out a way to do it. The student’s display can be seen when Butch Bando’s Fantasy of Lights opens on Nov. 17. DeMent said attendees won’t have any trouble spotting the students’ design. Bando said Wednesday he was very pleased with the students’ work and the DACC. Butch Bando’s Fantasy of Lights opens Nov. 17 and runs through Jan. 1, 2018. More information can be found at http://butchbandosfantasyoflights.com/.